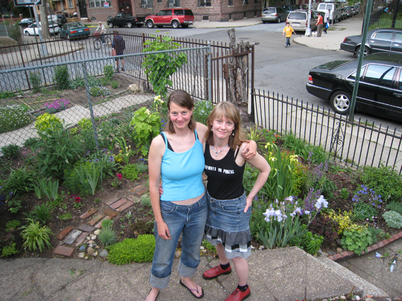 My sister Mary came to visit this weekend and since a friend had requested a photo of the two of us in my garden, Brandon snapped one for us while I was out pulling weeds. 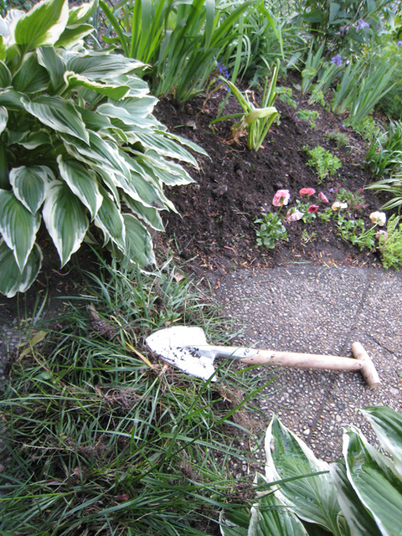 Using my nifty new spade, I took out the last remaining bit of weedy grass on the west half of my garden, disturbing a bunch of rather docile, yellow-orange ants in the process. The whole yard was full of this tufty grass when I started gardening there and I've been slowly erradicating it as I gain new plants. I popped in another purple allium like the other one near the fence and a blue aquilegia as well. Planted leek and collard green seeds today, too. I hope they'll germinate. Your garden looks great. You've managed to fit so much into a small space.